Prescription medication can be a lifesaver. It can thin your blood, reducing the risk for clotting and stroke. It can ward off illness and disease. It can even add countless years to your life. However, mixing chemicals in the body can lead to disaster. For instance, blood thinners, such as Coumadin, can become too active and cause significant and even life threatening bleeding if incorrectly mixed with antibiotics; or a combination of sedatives can cause your brain to forget to tell your body to breathe. Doubling up on medications can be just as dangerous – causing hallucinations, blackouts and even death in prolonged instances. It is also very dangerous to forget to take certain medications. If your doctor prescribed a blood thinner to reduce the risk of blood clots or stroke and you don’t take that medicine, you run the risk of becoming incapacitated or even dying! Don’t risk it. 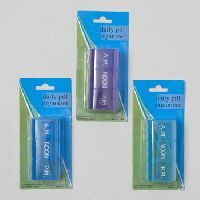 The Daily Pill Organizer from Houseware Warehouse can help you organize your medicines, so you know what to take when and if you have missed any. It is also a wonderful aid for organizing your vitamin intake. As you may know, some vitamins work well together. For example, vitamin C is a great booster for E as well as iron supplements. The Daily Pill Organizer can help you organize your vitamins so you are getting the best bang for your buck and you don’t forget to take them either! So let your fingers do the walking and head on over to HousewareWarehouse.net. You can order your Houseware Warehouse Daily Pill Organizer today!